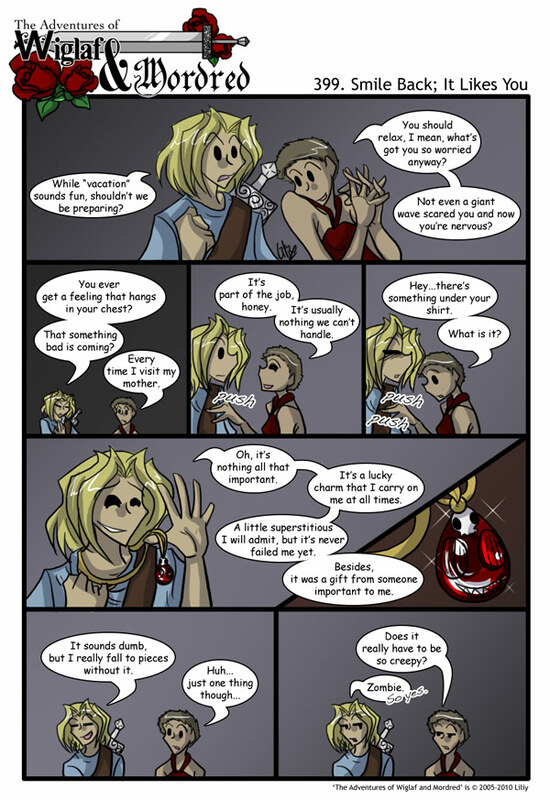 The Comic: Gawain reveals his awesome pendant thing. It is a solid stone & yes there is a creepy smiley face carved into it. Hagen does not like pendant. Hee. The Cameo: Mordred is jumping universes. VOTE: TGT Battle is on! Vote for WaM! I’m episode 87! You know you wanna’ go show your support! I think you can vote once a day until August 1st! The Random: Starcraft II is awesome. Plain & Simple. It’s reminded me of a great love for Southern Drawls and country music. And Tychus Findlay. Heck. Yeah. FIRST COMMENT? I knew being an insomniac was good for something! Then how are Mordred & The Gang going to take it? Have Gawain tag along everywhere they go? Because they can’t take it off of him! Oh yes. Zombie boy falling to pieces would be bad…OK sorta funny but bad. The second panel was pure excellence in every way, gloomy background, ominous foreshadowing and oblivious comedy. Hmmmm. I wonder if Gawain literally falls to pieces without his pendent, like turns into a pile of severed limbs disconnected from a headless torso. And I’m suddenly a huge fan of Gawain and Hagen. Heh… I am thinkings this is some kind of mysterious nothing… YOUR MESSING WITH US! Haha, so this is what keeps him from rotting? It reminds me of the crimson behelit from Berserk.